From washing produce to grating cheese to peeling potatoes, one of my goals is for my daughters to be comfortable in the kitchen at an early age. 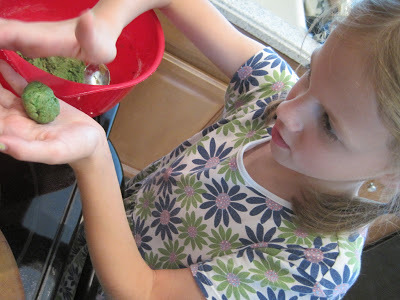 Since we stay busier during the school year, summer is the perfect time to get them involved with cooking beyond helping me bake cookies on the weekend. A favorite lunch this summer has been what our girls call “butter pasta.” It’s a simple dish and I was confident that my ten-year-old could handle making it on her own. Last week I supervised as she boiled the water, added the penne pasta, set the timer for the appropriate cooking time, then drained the pasta in the colander. She added butter, sprinkled on Parmesan cheese, tossed it all together, and served herself and her sister. The following day, she repeated the meal without any help (except my watchful eye), and she’s quite proud of what she can do. She now wants to learn how to make pancakes by herself, so we plan to attempt that soon. While it takes some extra time and instruction, I’m glad that our girls enjoy being in the kitchen and want to continue to encourage them in their culinary efforts! Do your children like helping in the kitchen? Oh, yes! My older two children, especially my daughter, beg me to let them help in the kitchen. Since I also want my children, especially my daughters, to be comfortable in the kitchen, I let them whenever I can. I must admit that I look forward to the time when I can turn them loose in the kitchen and let them fix breakfast or cook supper, while I…well, do something else! I am right there with you! While the ultimate goal is for them to be able to function well in their own kitchen some day, it will be nice when they can contribute to our family by making meals for all of us to enjoy. I never helped much in the kitchen when I was young, either, so this is kind of new territory for me – but very rewarding!